Are you looking for extra long or extra wide tablecloths? A tablecloth so large and wide it can cover anything? Then look no further! We can manufacture them for you. 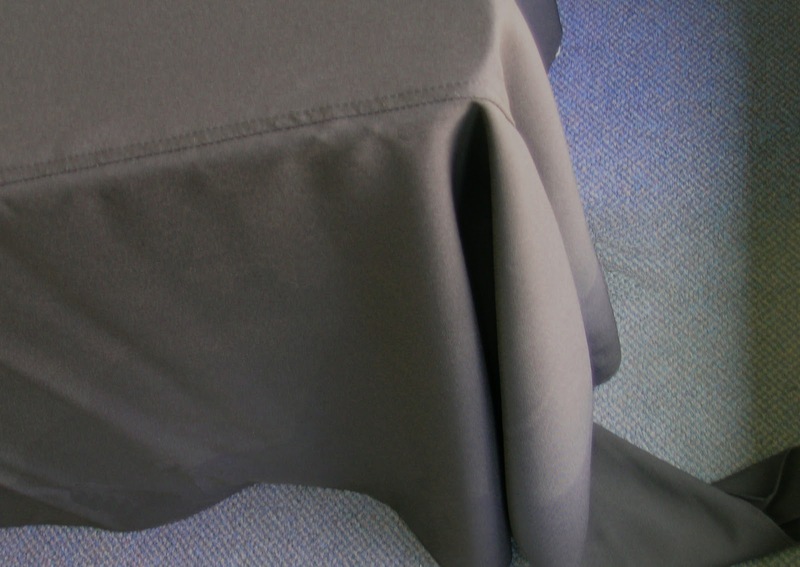 We use our Premier polyester fabric for our extra long/wide tablecloths. We manufacture them using Premier because it is a very durable, commercial grade fabric for hotels, restaurants, caterers, event planners and more! We receive a lot of requests for tablecloths in special sizes from trade show coordinators, who need to cover everything from displays, to stages, to oversized tables and more. They order our Premier tablecloths tablecloths in the size they need, which is any size width by length required. Because the material is 72” wide on the roll, we can join it together if you need it to be wider. Sometimes we have joined several pieces together to create extra long pieces that can drape over anything. When the fabric is joined, we do so by sewing it together. Here is a picture of what the seam will look like. It’s flat, and usually falls towards the edge of the table. Regardless, it looks very professional, and allows you to cover any part of your trade show booth, or large catering table, etc. We can offer multiple colors, and also table skirting or drapes. We recently did a long cloth for LightStream who used it at their trade show. Stephanie Dale wrote us, “The trade show opened this a.m. in New Orleans ~ the infamous extra long tablecloth is in the attached photo =). Thanks, again for all your help with it.” They selected our black Satin polyester for their tablecloth as they wanted something that reflects light, and stands out from all the other trade show booths. There is no minimum order on an extra wide or extra long tablecloth, however if you are ordering multiples, we can offer a discount.